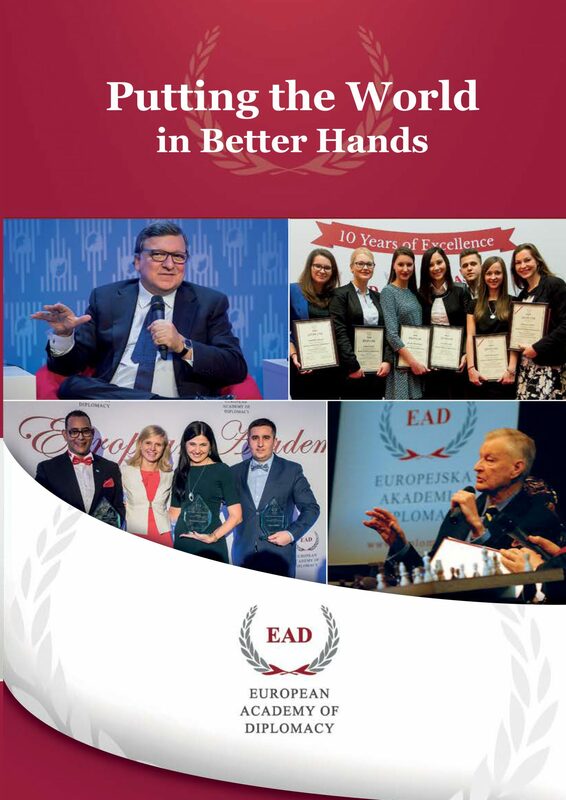 The ceremony was opened by the Director and Founder of the European Academy of Diplomacy, Dr. Katarzyna Pisarska, who welcomed the more than 500 distinguished guests, students of the EAD, members of the European and Polish Parliaments, diplomats, and VIPs, which included President Mikheil Saakashvili, Dr. Jacek Saryusz-Wolski (Member of the European Parliament), Ambassador Borys Tarasyuk (former Minister of Foreign Affairs of Ukraine), Ambassador Stepan Grigoryan (former Armenian Ambassador to Russia), Dr. Aliaksandr Milinkievic (Leaders of the Opposition in Belarus and 2006 Presidential Candidate), Krzysztof Jaraczewski (Director of the Jozef Piłsudski Museum in Sulejow and grandson of Marshall Piłsudski), and Andros Barnovi (Director of the Mikheil Saakashvili Presidential Library). Following a laudation speech by Dr. Saryusz-Wolski, President Saakashvili addressed the students of the Academy of Young Diplomats on the challenges of maintaining independence and democracy in Eastern Partnership. The graduation of the 10th edition of the Academy of Young Diplomats saw more than 190 students receive diplomas for successful completion of the program and 5 best students were honored for their academic achievement during the program. The 5 honor students were given their awards by President Saakashvili before Dr. Pisarska personally presented 100 students in attendance their diplomas. The 11th edition of the Academy of Young Diplomats was opened by Ambassador Jan Wojciech Piekarski (Head of the EAD Council of Ambassadors) and the patron of this edition, Marshall Jozef Piłsudski, was introduced by Krzysztof Jaraczewski. 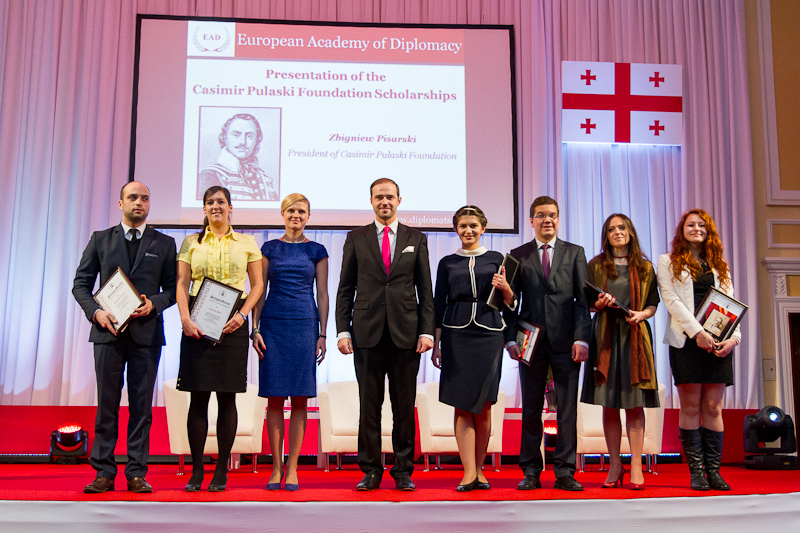 Zbigniew Pisarski presented 5 students from the 11th edition with the Casimir Pułaski Foundation Scholarship for the Academy of Young Diplomats. Following a coffee and wine break, the second part of the ceremony saw Dr. Pisarska tell the 10 year story of the European Academy of Diplomacy and our plans for the future – 2015 International Forum for Diplomatic Training, Development of the EAD Scholarship Endowment, Building the EAD Campus and investing in the Alumni network – before presenting the 2014 Alumni of the Year Award to Żenia Klimczak (Kazakhstan), Octavian Milewski (Moldova), Duvan Ocampo (Colombia) and Leszek Pochron-Frankowski (Poland) for their professional and academic excellence. The day’s events closed with a panel discussion on “Eastern Partnership 2.0: Can European Soft Power Withstand Russian Hard Power”. Taking part in the event was President Saakashvili, Ambassador Borys Tarasyuk, Ambassador Stepan Grigoryan, Dr. Aliaksandr Milinkievic and Dr. Katarzyna Pisarska (moderator).